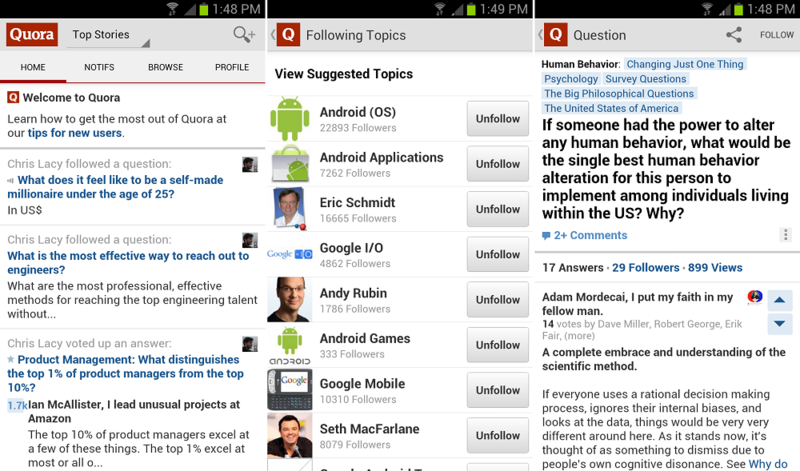 Official Quora App Hits Google Play, It’s Twitter Meets Yahoo Answers? As someone who knew absolutely nothing about Quora before hearing about the application, I had to go out and do some research to figure out what the heck it was. Turns out, there’s a service out there that allows users to post questions for professionals and friends to answer. Along with questions, you can choose to follow certain topics and areas of interest. As seen above, I have started to follow most things Android and Google related. The application connects seamlessly with your Facebook and Twitter account, so connecting with friends to answer and ask questions is really easy. Grab it and let us know what you think. As for me, it’s getting hard to keep track of all this social media stuff. Wednesday Poll: Are You Buying Any of Motorola's New RAZR Devices?